The Minority in Parliament has walked out of the House as Lydia Alhassan has been sworn in MP for Ayawaso West Wuogon constituency Tuesday morning. 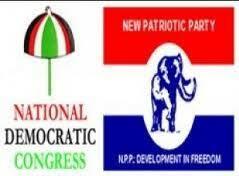 The National Democratic Congress (NDC) Parliamentarians say they do not want to be associated with the process. Minority Chief Whip, Muntaka Mubarak Mohammed, told the House their walking out is in solidarity with the victims of the violence that occurred at the La Bawaleshie polling centre on the voting day, Joy News’ Joseph Opoku Gakpo has reported. “…in to support our comrades and citizens that were unnecessarily hurt and brutally assaulted, I am sorry to say that with your indulgence, our side of the house cannot be here to witness this swearing in,” he said amid cheers from his colleague Minority MPs. The First Deputy Speaker of Parliament, Joseph Osei Owusu, however, went ahead and sworn Mrs. Alhassan into office. The Deputy Majority Leader, Adwoa Sarfo expressed her disappointment at the stance of the Minority, saying that the swearing in was in line with the Constitution of Ghana. “…we will not be perturbed by the absence of the other side. Business will continue as usual,” she said amid cheers from the Majority. She added that the House will continue with the business for the day. Why is the Minority protesting? On January 31, 2019 electorates in the over 130 polling centres in the Ayawaso West Wuogon constituency in Accra voted to elect a new MP to replace Emmanuel Agyarko who died in November 2018. However, a few hours into the election, armed men stormed the residence of NDC candidate, Delali Kwesi Brempong and engaged in a shooting spree. The violence escalated to the La Bawaleshie polling centre close by and the NDC withdrew their agents from all the other 130 polling centres, citing intimidation. President Akufo-Addo has also condemned the incident but described it as an isolated case of violence. In a twist however, Minister of State in charge of National Security, Bryan Acheampong, said the men were National Security operatives who were acting on intelligence although he said he was not at liberty to reveal what they were after.